WILEY SANDERSON PAGE in a promotional packet for the University of Georgia’s art department, circa 1955. Courtesy of Hargrett Rare Book and Manuscript Library, University of Georgia Libraries. Τhe stories about photographer Wiley Sanderson (1918–2011) are legendary and sometimes shocking. Most of them come from his students and colleagues at the University of Georgia and involve his insistence that the darkroom be spotless (did he really make students lick the floor to prove its cleanliness? ), his raging diatribes and his inclination to pop out his glass eye to show the custom “WS” logo painted on it. When his work was included recently in a craft history exhibition at the Georgia Museum of Art, visitors who knew him were surprised to learn that this single-minded, unyielding pioneer in bringing pinhole cameras to university classrooms was also an accomplished mid-century jeweler, metalsmith and weaver. 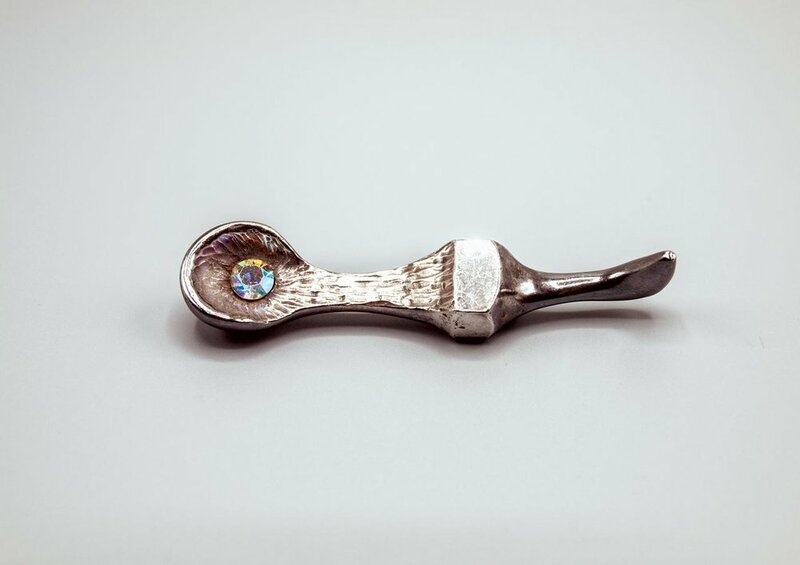 Few people, even within his own community, were aware that for two decades, from the late 1940s through the late 1960s, he investigated the possibilities of materials and techniques in modern jewelry. Wiley Devere Sanderson, Jr., was born in Detroit, Michigan, to a mother who became head of the home economics department at Wayne State University and a father who was an electrical engineer. He took an early interest in photography and soon developed an awareness of craft and design as well. He attended Olivet College in Michigan, and studied at the Mills College Summer Session of 1940 in Oakland, California, with Bauhaus artists László Moholy-Nagy and György Kepes. Then, from 1941 to 1945, he served as an instrument flying instructor in the United States Army Air Corps, teaching pilots how to use the complex instruments on cockpit panels. He married Rosella “Roz” Nagle (1926–2010) in 1944, and they had three daughters. Sanderson wrote in his thesis, “Metal Expression by Centrifugal Casting,” that centrifugal casting (in which he used the lost-wax method to create a mold that he then put in a machine that spun the mold, forcing metal into the cavity) had “grown in stature through industrial research,” and described its value to craft as “its directness of fabrication.” He added, “My enthusiasm over this new-found technique was spurred on by the freedom and inspiration of Cranbrook.” The centrifugal casting technique was developed in England in the early nineteenth century, revived by dentists in the early twentieth century, then, according to Janet Koplos and Bruce Metcalf in Makers: A History of American Studio Craft, was adopted by jewelry manufacturers in the 1930s, with studio jewelers following close behind. Marbeth Schon, in Form & Function: American Modernist Jewelry, 1940-1970, credits Bob Winston as the first to incorporate the process into courses at an institution of higher learning, the California College of Arts and Crafts in Oakland, in the mid-1940s. So, when Sanderson focused on the technique at Cranbrook, it was a relatively new skill for a studio craftsman and he was helping to expand and refine the process. 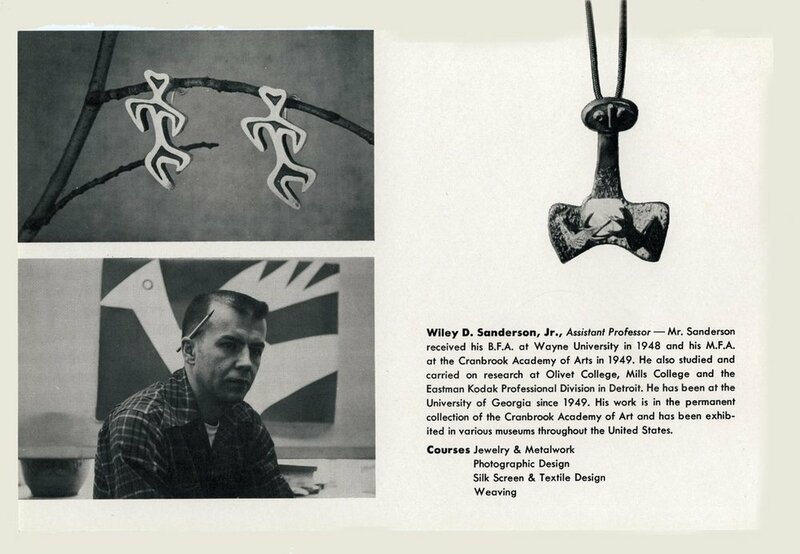 Mickey Story, an instructor in the Applied Arts Department at Texas Technical College, referenced Sanderson’s thesis when she wrote Centrifugal Casting as a Jewelry Process in 1963, which indicates that his research was considered informative and important within the field. BROOCH of sterling silver and rhinestones, 6.4 x 4.8 x 2.5 centimeters. Collection of Janet Sanderson Johnson. Photograph by Demitra Thomloudis. Shortly following his graduation in 1949, Sanderson moved to Athens, Georgia, to teach craft at the University of Georgia, and remained there for the rest of his career. Like other programs around the country, the art department at UGA expanded rapidly in the years following World War II with returning servicemen attending school on the G. I. Bill. As the craft instructor, Sanderson covered topics in metals and textiles; the other craft area taught there, ceramics, had its own faculty. A description of the skills covered in one of Sanderson’s jewelry and metalwork classes, listed in the university’s 1950-51 catalogue, reads, “a thorough grounding in the techniques necessary to execute well-designed objects in metal; including forming, chain-making, chasing, repoussé, stone setting, tool making, metal finishing, enameling, and centrifugal casting,” reflecting Sanderson’s broad knowledge of techniques. In an interview with the Detroit News, Sanderson extolled the importance of the workshop: “It’s up to today’s craftsmen to make tomorrow’s heirlooms... Machines can’t shape metal, blend threads or mold clay like a pair of loving hands.”(4) He described silversmithing as “almost a lost art” in the United States until the workshops began. Sanderson acknowledged that the objects created by silversmiths were expensive because they required so much labor but proposed that, with more opportunities to see such work, the public would realize that “hand-wrought metal has more individuality, more warmth than machine-made products.” Sanderson created a modern coffee pot during the workshop that was included in a traveling exhibition of works completed by the participants. BROOCH of sterling silver and rhinestone, 2.5 x 4.8 x 1.6 centimeters. Collection of Janet Sanderson Johnson. Photograph by Demitra Thomloudis. VINTAGE PHOTOGRAPH of cast silver brooch made to suggest a martini glass. Collection of Jewelry and Metalwork, Lamar Dodd School of Art, University of Georgia. Photograph by Wiley Sanderson. The majority of Sanderson’s known surviving jewelry, and much of what is recorded in period photographs he took of his jewelry, is silver, often cast. Several brooches, with colorful rhinestones, have rough textures that create strong contrasts between light and dark. Some works feature small gold accents, such as a gold wire squiggle hanging within an elongated crescent pendant or as round “eyeballs” in an undulating creature-like pendant. One set of cufflinks features lowercase “a”s and belonged to a former president of UGA, while another set of cufflinks with buttons as well features an abstract pattern with roughly radiating lines resembling orange slices; a set of buttons with a brooch, recorded in a photograph, had high relief designs suggesting martini glasses with olives. He marked much of his work with an abstract image of a horned figure, that may, according to his second wife, Mary Sayer Hammond, whom he married in 1983 (he and Roz had divorced around 1970), relate to a portrait a visiting artist did of him titled Satan Sanderson, suggesting an embrace of his reputation for being difficult. VINTAGE PHOTOGRAPH of a silver and cocobolo pickle fork. Collection of Jewelry and Metalwork, Lamar Dodd School of Art, University of Georgia. Photograph by Wiley Sanderson. 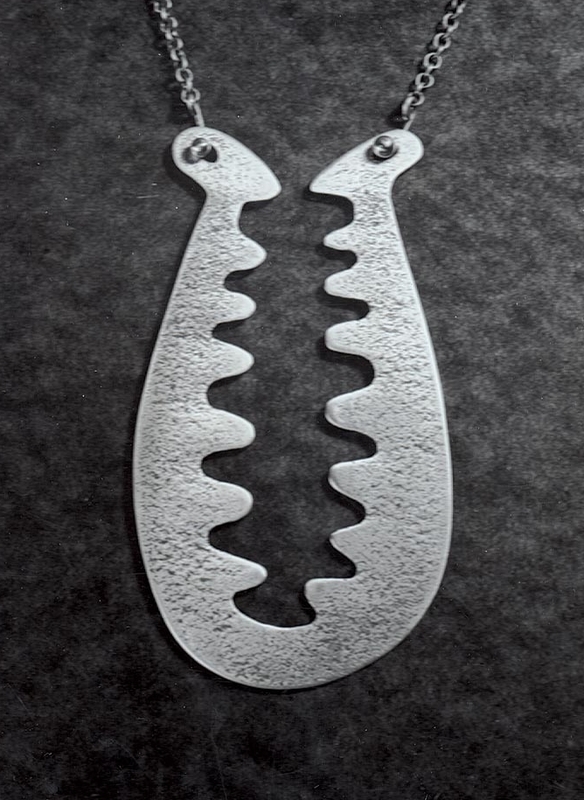 The most unusual area of Sanderson’s jewelry research involved using steel-loaded epoxy to form jewelry, which he first listed as an activity in 1964-65. He also invented a pigment-loaded epoxy to embellish the epoxy/steel-formed pieces, and he noted that it was “a means of ‘enameling’ metals that could not heretofore be enameled by conventional methods.” Unfortunately, no detailed accounts of this research are known. One surviving example of this jewelry is a cone-shaped pendant with bright red “enamel” on the outside and rhinestones affixed randomly to its dark interior. According to his family, he called the material he used “plastic steel,” which is the trade name of a metal-filled epoxy putty used for automotive, plumbing and similar repairs—Devcon’s Plastic Steel was introduced around 1956. His daughter Janet, who sometimes watched him work at home, believes he enjoyed the material because it was easy to use, allowed for freeform creations, and did not require a heat source when applying backs to brooches. Sanderson’s adaptation of this industrial material, and his interest in unconventional and nonprecious materials, was very forward thinking. According to Hammond, Sanderson repeatedly submitted the plastic steel work to competitions and shows, but it was regularly rejected because it was not traditional metal. It was not until several decades later that artists embraced a related modeling-clay-like, metal-infused material, Precious Metal Clay, which emphasizes how ahead of his time Sanderson was. 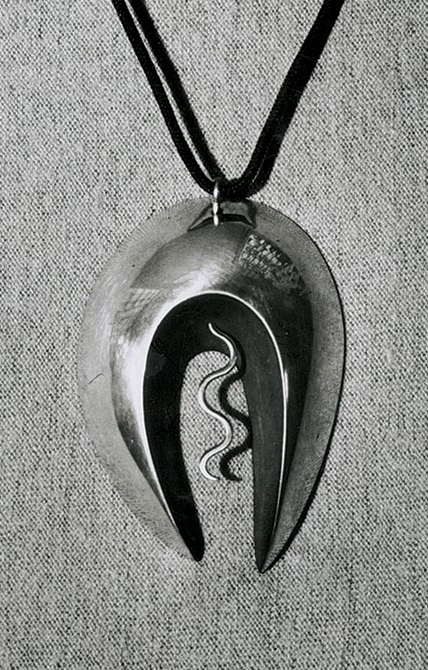 VINTAGE PHOTOGRAPH of a cast silver pendant with ebony bead. Collection of Jewelry and Metalwork, Lamar Dodd School of Art, University of Georgia. Photograph by Wiley Sanderson. Sanderson showed his work nationally in the 1950s, including in the First State Fair of Texas Invitational Craft Show, a contemporary jewelry exhibition at the University of Nebraska, and the Third Art Center Invitational Craft Show in Louisville, Kentucky. In 1954, the High Museum of Art, in Atlanta, presented his “unusual and distinctive jewelry,” along with the work of several of his students, in the exhibition “Contemporary Jewelry and Metal.”(6) Later, the exhibition “Craftsmen of the Southeastern States,” the last in a series of regional surveys organized by the American Craftsmen’s Council [ACC (Now known as the American Craft Council)], included a cast silver pendant with an aquamarine, titled The Gemologist, and a cast and forged silver and gold pickle fork by Sanderson. This show traveled during 1963–64 to the Atlanta Art Association, the Worcester Art Museum in Massachusetts, and the Museum of Contemporary Crafts in New York City. Like many university art faculty, Sanderson also gave lectures and led workshops outside of his classroom, and these reflected his interests in contemporary design and jewelry. 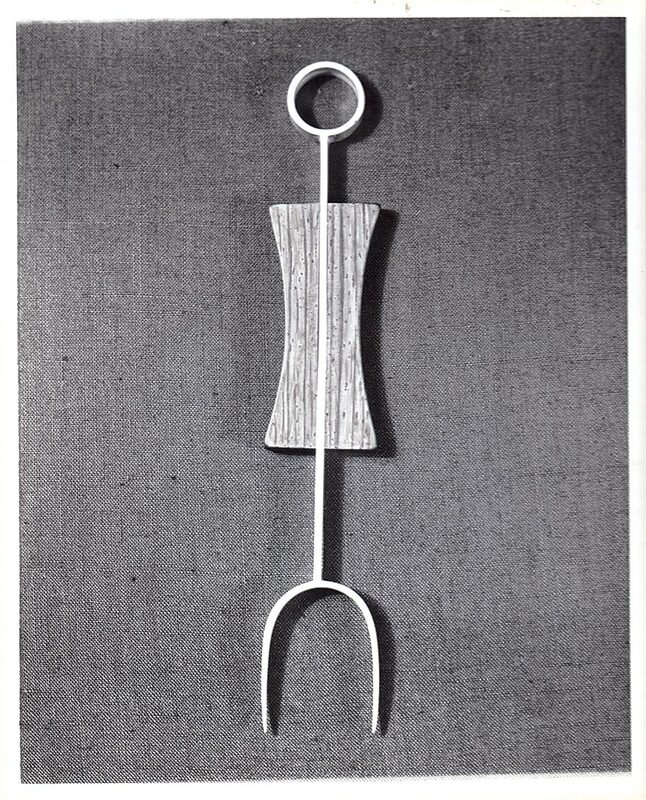 He presented a survey of contemporary design in metalwork to the Athens Home Demonstration Club in 1952; in 1957 he led a five-day workshop sponsored by the Chattahoochee Handweavers Guild at the Atlanta Art Institute on handwoven rugs, emphasizing Scandinavian flossa and rya methods; in 1959 he spoke to the Art Center Association in Louisville, Kentucky, about “Jewelry Design Today.” He addressed the National Art Education Association in Tampa, Florida, in 1960, about “Design for Today’s Craftsman.” In 1963 he gave a lecture on centrifugal casting at the Gatlinburg Craftsmen’s Fair and Conference in Tennessee; and in 1967 he spoke about contemporary design to the Chattahoochee Handweavers Guild. He led two workshops for southeastern regional conferences of the ACC, one on centrifugal casting in 1963 in Winston-Salem, North Carolina, and one titled “Photography for the Craftsmen” in 1966 in Athens, and was a founding member and early president of the Georgia Designer-Craftsmen group, which was organized in 1959 in Atlanta and affiliated with the ACC. PENDANT of metal-loaded epoxy and rhinestones, 7.0 x 3.8 x 0.6 centimeters. Collection of Janet Sanderson Johnson. Photograph by Demitra Thomloudis. As skilled as Sanderson was in crafts, his primary passion was photography. He introduced photography classes at UGA in 1953 and worked to incorporate photography in the craft program by, for example, investigating ways to use it to assist with the teaching of textile design. In 1967 the art department restructured its offerings, and Sanderson focused exclusively on photography, which became its own area, while additional faculty, Glen Kaufman and Robert Ebendorf, were hired to teach in the newly formed areas of fabric design and jewelry and metalwork—Sanderson took pride in having to be replaced, as he saw it, by multiple professors. The transition, though, was not seamless. Space was limited, and the studio that had housed all of craft now needed to accommodate both photography and jewelry and metalwork (fabric design settled in a nearby building), which he viewed as an encroachment into his territory. Indeed, there were arguments over space for years, until jewelry and metalwork moved to a different location on campus. Sanderson retired in 1989. Though he spent almost half of his teaching career in craft, that area is overshadowed by his time in photography—more than twenty years worth of students have memories of making pinhole cameras with him. In addition to his focus on photography in the later decades of his career, several other factors contribute to the lack of recognition of his role as a mid-century modern jeweler: he rarely talked about his earlier work; his mark is not easy to read nor well known, hampering identification; and, as he was not bound by any need to make a profit from his creations and worked in multiple fields, the volume of his production of jewelry was limited. However, Sanderson created a body of innovative, distinctive work that presents an addition to the canon of mid-century American modern silversmiths, especially in the Southeast, and reflects the spread of modern jewelry techniques and styles in the post-war years. VINTAGE PHOTOGRAPH of a design for a sapphire engagement ring in gold (in progress). Collection of Jewelry and Metalwork, Lamar Dodd School of Art, University of Georgia. Photograph by Wiley Sanderson. PHOTOGRAPH OF WILEY SANDERSON, Detroit News, September 1, 1950. Courtesy of Hargrett Rare Book and Manuscript Library, University of Georgia Libraries. 1—For more on the history of metalwork at Cranbrook, see J. David Farmer, “Metalwork and Bookbinding,” in Design in America: The Cranbrook Vision, 1925-1950, New York: Harry N. Abrams in association with the Detroit Institute of Arts and the Metropolitan Museum of Art, 145-171. 2—Martin Magid, “When I become a man I would like to be an artist,” Photographica World 156: 50, 2017. 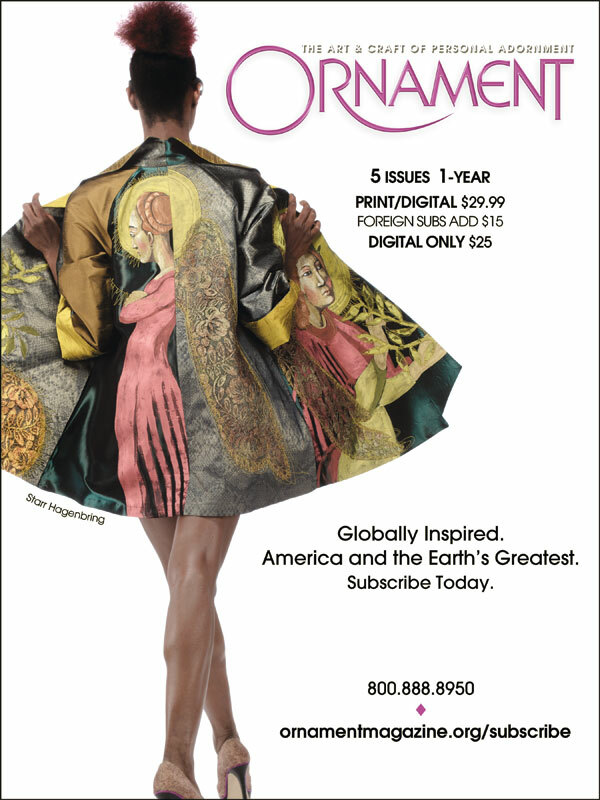 3—Jeannine Falino and Yvonne Markowitz, “Margret Craver: A Foremost 20th Century Jeweler and Educator,” Jewelry, The Journal of the American Society of Jewelry Historians 1: 15, 1996-97. 4—Joy Hakanson, “Detroit Silversmith Shapes Tomorrow’s Heirlooms,” Detroit News, September 1, 1950. 5—Annual reports and faculty files are in the collection of the Hargrett Rare Book and Manuscript Library, University of Georgia Libraries. 6—“Surrealistic Touch Marks Baker Show,” Atlanta Journal and Atlanta Constitution, April 25, 1954. The students were Marion Davidson, Dan Berry and Aubrey Henley. Ashley Callahan, Annelies Mondi and Mary Hallam Pearse. Crafting History: Textiles, Metals, and Ceramics at the University of Georgia. Athens: Georgia Museum of Art, 2018. Jeannine Falino, ed. Crafting Modernism: Midcentury American Art and Design. New York: Abrams in association with the Museum of Arts and Design, 2011. Martin Magid. “When I become a man I would like to be an artist,” Photographica World 15: 48-55, 2017. Marbeth Schon. Modernist Jewelry 1930-1960, The Wearable Art Movement. Atglen, PA: Schiffer, 2004. —. Form & Function: American Modernist Jewelry, 1940-1970. Atglen, PA: Schiffer, 2008. Ashley Callahan is an independent scholar and curator in Athens, Georgia, with a specialty in modern and contemporary American decorative arts. Together with Annelies Mondi, deputy director at the Georgia Museum of Art, and Mary Hallam Pearse, she recently co-curated an exhibition at the museum titled “Crafting History: Textiles, Metals, and Ceramics at the University of Georgia” that included works by Wiley Sanderson. She was pleased to have a chance to expand the research from that project and appreciated the assistance she received from Sanderson’s daughter, Janet Johnson, scholar Martin Magid who recently wrote about him for Photographica World, his widow Mary Sayer Hammond, and everyone at the Hargrett Rare Book and Manuscript Library, University of Georgia Libraries.